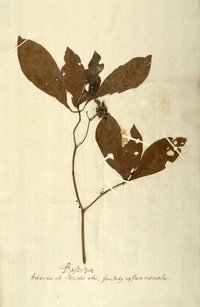 Arbuscula est flosculis albis, fructubus ex flavo rubentibus. Deze kleine boom heeft witte bloempjes en vruchten die van geel rood worden. This little tree has small white flowers and fruits which turn from yellow into red.